A newfound pair of giant viruses have massive genomes and the most complete resources for building proteins ever seen in the viral world. They have refreshed the debate about the origins of these parasites. 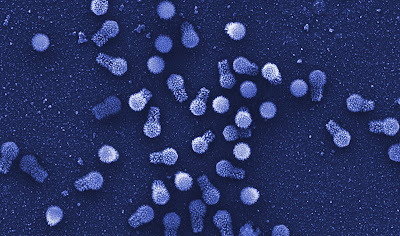 This scanning electron micrograph shows tupanviruses — a newly discovered type of giant virus that is typically more than a micron long. They may hold clues to the evolution of all viruses. For decades, descriptions of viruses have straddled life and nonlife, a divide that usually isn’t difficult to navigate. Their hallmark characteristics, namely their small size, tiny genomes and parasitic dependence on cellular hosts for replication, set them apart from all other living things despite their animation. But that story has gotten far more puzzling — particularly since the discovery of the first giant virus in 2003, which was so large that researchers initially thought it was a bacterium. Several families of giant viruses are now known, and some of those giants have more than 1,000 genes; one has a whopping 2,500. 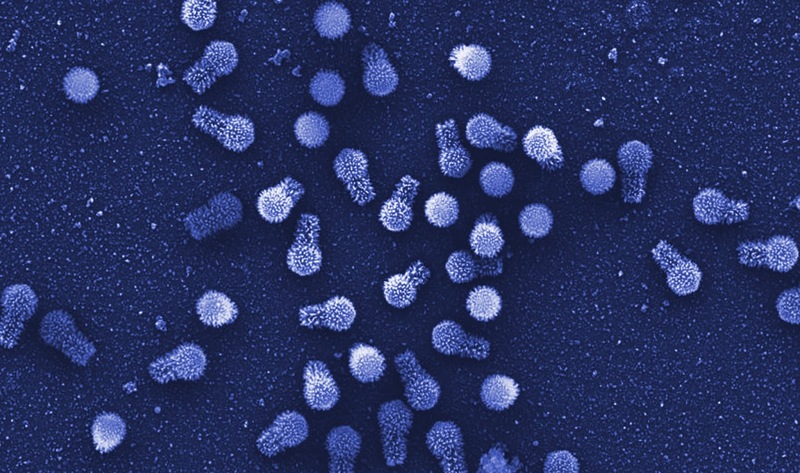 (By comparison, some small viruses have only four genes.) Among those genes are ones involved in translation, the synthesis of proteins — a finding that came as a shock. “It appears that giant viruses are as complex as living organisms,” said Chantal Abergel, an evolutionary biologist at Aix-Marseille University in France. That conclusion was reinforced last week when scientists reported in Nature Communications that they had found two new giant amoeba-infecting viruses in Brazil, which they named tupanviruses (after Tupã, a thunder god of the regional people). Tupanviruses are striking, and not just because they possess long tails: They have the most complete set of translation-related genes seen to date, including those for all 20 of the enzymes that determine the specificity of the genetic code. The only components they are missing are full-length ribosomal genes. Whether all those elements actually function still needs to be tested. Tupanviruses are not unique: Last year, for example, researchers published an analysis of a different group of new giant viruses called klosneuviruses, which similarly turned out to encode an extensive protein-making apparatus. “It’s remarkable that viruses seem to mingle into the translational domain so extensively,” said Matthias Fischer, a virologist at the Max Planck Institute for Medical Research in Germany who was not involved with either study. That mingling has sparked contentious debate among scientists about when and how giant viruses evolved. All of viral evolution is murky: Different groups of viruses likely had very different origins. Some may have been degenerate “escapees” from cellular genomes, while others descended directly from the primordial soup. “Still others have recombined and exchanged genes so many times in the course of evolution that we will never know where they originally came from,” Fischer said. As examples of this diversity, giant viruses could help illuminate more about how viruses operate and evolve. But even their own origins and evolutionary path are unsettled. One side holds that the giant viruses evolved from smaller viruses over 2 billion years by adding genes, through processes such as horizontal gene transfer and gene duplication. The other maintains that the viruses started out large from the very beginning — and may even have been autonomous organisms — before losing genes they no longer needed and diversifying into the strains we see today. The reason for the split lies in the fact that some of the giant viruses’ genes are related to those found in other cellular organisms — archaea, bacteria and eukaryotes — on the tree of life, while others appear to be completely unlike anything else on record. Thirty percent of the tupanvirus genome falls into the latter category, and in other viruses that fraction is even larger. A ciência nem sempre se autocorrige!